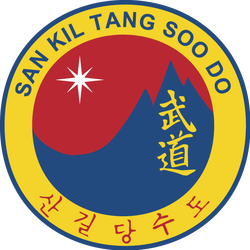 The hangul along the bottom of the ring reads "San Kil Tang Soo Do". The use of hangul is to remind us of the Korean and Chinese heritage of the art and the historical influences that those cultures have played in the development of the art. The color red represents the fruitful result of those influences and the active (Yang) commitment of the masters and grandmasters of Tang Soo Do to carry on the philosophy and principles of Tang Soo Do as were originally developed and taught by the late Kwan Jang Nim Hwang Kee and their determination to further the traditions, refinement and growth of this martial art. Red (Yang) represents FIRE. In San Kil Tang Soo Do the “fire of discipline” refines our character. Blue (Um) represents Water. In San Kil Tang Soo Do “nurturing water” improves our fellowship with others.